Students of color and women have historically been absent from the science, technology, engineering and math (STEM) field. According to the 2013 Census Bureau report, Hispanic Americans make up 6.5% and African Americans only make up 6.4% of the people employed in the STEM field, in comparison to their white counterparts who make up 70% of those employed in the same field. In post-secondary institutions, very few students of color are choosing to major in these areas of study. The disparity is even more apparent when it comes to gender, in 2011 women made up only 26% of all the people employed in the STEM field, while men made up the remaining 76%. The Cheyney Foundation is making strides to further support students of color interested in pursuing careers in the STEM Field. The Cheyney Foundation is a 501 (c) (3) nonprofit organization that directly supports Cheyney University. Cheyney University (“Cheyney”) is the first historically black college or university (HBCU). The institution, which was established in 1837, has had a mission of educating students from African descent since its inception. More recently, Cheyney boasts a diverse population of people from all walks of life. In light of the national push to get more students of color interested in STEM, the institution has seen an increase in research participation by both students and faculty, an increase in STEM enrollment as well as an increase students attending graduate and health professional schools after graduation. Cheyney University like many other HBCUs supports its students through a family oriented culture on campus. Students regard the institution as a safe place; a place where they feel welcome and a home away from home and for many, the only home they know. Although the institution is about 40 miles away from one of the nation’s poorest cities, Philadelphia, the institution serves a predominantly low income population. With 75% of the students who come from low income backgrounds. Tuition at the university is amongst the lowest in the state, but many students still struggle to pay their term bills or even afford books, on-campus housing or other supplies to have a well rounded college experience. The Cheyney Foundation has been supporting Cheyney University since 1971. As an organization, we have given over $2.4 million to support the advancement of the university over the past 46 years. This year, the Cheyney Foundation received a $25,000 grant from PECO to support the advancement of STEM scholars at Cheyney. This grant provided financial relief to 8 brilliant students who were in dire need of funding to continue their education. Of those 8 students, 75% of those students were women of color. The testimonies from each student revealed that for many students the only barrier between them and pursuing a STEM degree was the funding. Many students who studied STEM found themselves working multiple jobs to finance their education and were often distracted from their commitment to their academic goals because they had other roles outside of school. Some of the students were parents, some had to take care of siblings and others simply worked to further finance their education. With the funding, these students received they are now able to focus more on their academics and participate in experiential education opportunities to supplement their studies. This was all made possible thanks to the generosity of PECO, a corporation that has supported Cheyney University for decades and believes in the dreams of Cheyney students. On June 22, 2017, we honored the 8 students who were awarded the scholarship and acknowledged them for all of their hard work. We congratulated them for overcoming the obstacles that would normally bog someone down and celebrated their aspirations of becoming dentists, urban farmers, veterinarians, nutritionists and child care specialists. As we move into our next fiscal year, we are interested in supporting more students of color and women who are interested in STEM. We are hoping to secure more funding for STEM students and to provide more opportunities for students to grow professionally without worrying about finding the funds to excel. Are you interested in joining us in support of Cheyney students? Feel free to contact us at info@cheyneyfoundation.org or feel free to donate to our Cheyney 180 Challenge https://www.cheyneyfoundation.org/about-us/cheyney180challenge/ today! 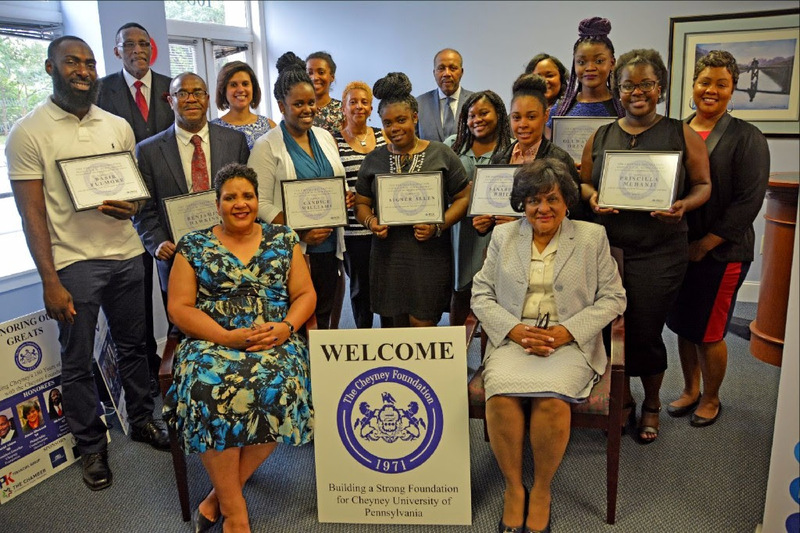 PECO Supports the Cheyney Foundation by providing Scholarships to Alleviate Financial Barriers for 8 S.T.E.M. Students at Cheyney University. 2019 © The Cheyney Foundation. Crafted with love by SiteOrigin.